Well, 2019 has already started, and exactly what trends, events, and happenings will emerge is not quite clear yet. However, one trend that is pretty clear is the seemingly unstoppable growth of Vietnam’s Viet Jet Air LCC. 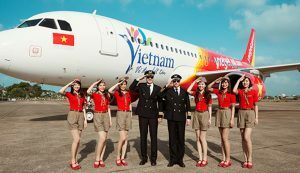 Coming out of nowhere in 2011, Vietnam’s first privately owned airline has made nothing but headlines and mostly for the right reasons. Viet Jet was conceived and realized by its dynamic founder, 47-year-old Nguyen Thi Phuong Thao. Ms. Nguyen, who has a personal fortune estimated at $1.7 billion, was educated in Russia and holds a Ph.D. in Economic Management. After graduation she worked at various projects and was a commodity trader before hitting upon the idea of starting a LCC in her home country. Her timing was good in the macro sense, as she caught a rising trend not only in her home country but also in South East Asia as a whole. Rising fuel prices grounded her dream for a couple of years, but in 2011 the airline took off. Ms. Nguyen is only one of two female CEO’s in the world’s top 100 airlines. Her style of management echoes another independent CEO and founder, Virgin Atlantic’s Sir Richard Branson. And like Branson, she is not averse to the “big publicity stunt.” In Viet Jet Air’s case it was having the female cabin crew wear bikini swimsuits on flights to beach destinations. This stunt ran afoul of the conservative government bureaucrats in Hanoi who fined the company, but brought her airline worldwide publicity. ( In an interview Ms. Nguyen said that the crew are not forced to wear bikinis.) Bright colors and pretty young cabin crew seem to be the hallmark of the airline’s brand. 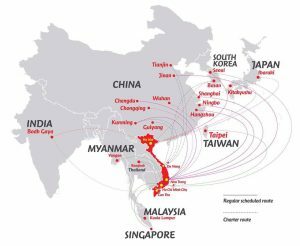 Of particular interest are Viet Jet Air’s routes to second-tier Chinese cities, which, of course, will eventually become first-tier cities to which the airline has locked- in routes. 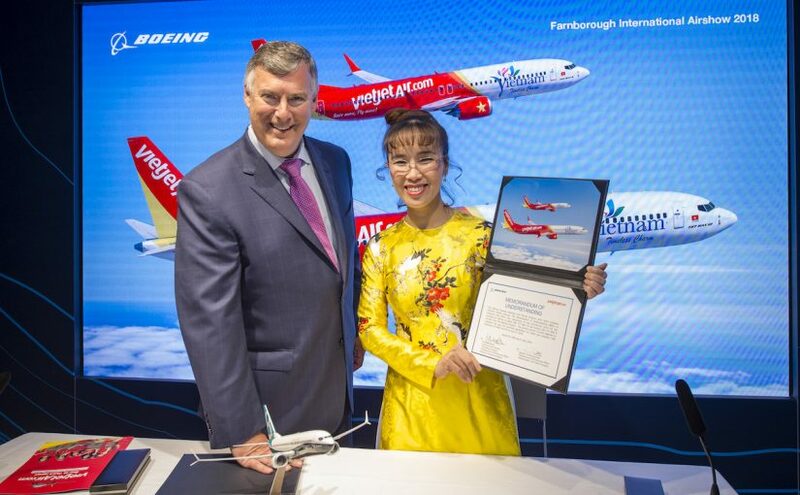 Ms. Nguyen certainly looks like she has big plans for the airline, that is, if aircraft purchases can be used as a measure of her ambition. It was announced on July 18, 2018 that a deal had been struck with Boeing Commercial Airplanes to purchase 100 B737 MAX aircraft for a price of $12.7 billion. And on November 2, 2018 another deal was signed to buy 50 Airbus A321neo planes for $16.5 billion. Viet Jet Air is already a local and regional player, and from the above purchases it can be seen that it has real plans and capability to extend its reach globally. The airline’s English slogan is “Enjoy Flying!” It looks like in the future more and more people will be flying this airline and perhaps doing just that: enjoying flying at reasonable prices. Photos and Graphic: Viet Jet Air website. Flying Over A War Zone – Who is Responsible? Flying With LCC – Is it Safe? Air Travel-How Safe Do You Feel? 前 前の投稿: China’s Belt and Road and the Indo-Pacific.